Rafael Nadal is 66–1 at Roland Garros with his only loss coming in 2009 to Robin Soderling, but after a poor clay season and the lowest ATP ranking in ten years, Nadal is seeded at No. 6 and could face off against Novak Djokovic in the quarterfinals. Rafael Nadal is 66–1 at Roland Garros with his only loss coming in 2009 to Robin Soderling. He is the defending champion again this year but has struggled through the clay court season in 2015, failing to make a final in the lead-up tournaments and his ranking has dropped to No. 7, the lowest in ten years. He’s only been pushed to five sets twice in his 66 wins and he’s ended World No. 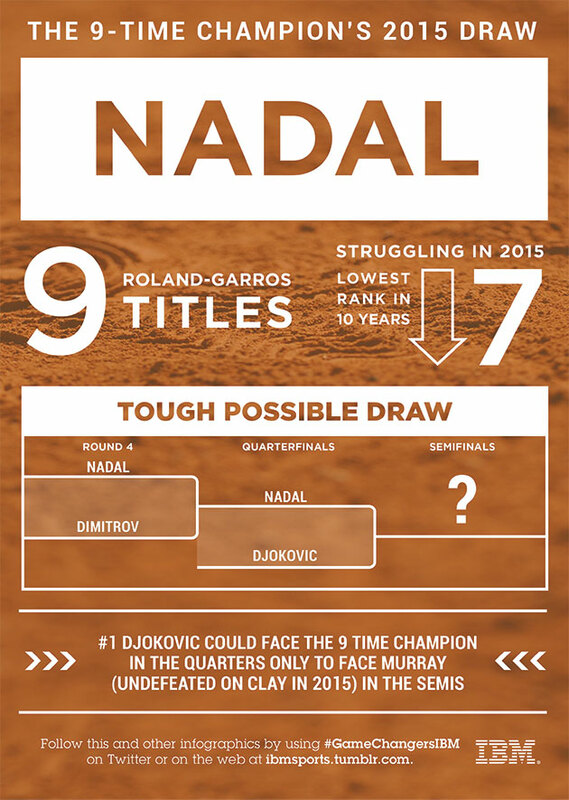 1 Novak Djokovic’s quest for a French Open title the last three years. But seeded at No. 6 in the French Open, Nadal was given a tough draw and could potentially face off against Djokovic in the quarterfinals.